Chaos and destruction are all that DECEPTICON RUMBLE lives for. His powerful pile drivers send shuddering shockwaves through the earth strong enough to knock AUTOBOTS from their feet, collapse buildings, and open chasms in the ground. He opens every DECEPTICON assault with an overwhelming seismic assault that can send entire armies sprawling. Along with his love of destruction goes a sarcastic sense of humor that he uses to issue a steady stream of insults against any enemy unlucky enough to get within earshot. Converts from robot to vehicle! The destructive warrior DECEPTICON RUMBLE converts from cool tuner car to a sarcastic anarchist and back. His pile drivers snap on to get him ready for any battle situation you can imagine. Battle him against your other TRANSFORMERS figures! Includes: Converting DECEPTICON RUMBLE action figure and 2 snap-on pile drivers. Features: • Pile drivers snap on to robot mode! 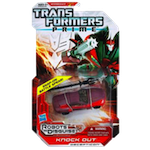 • Level 2 – Intermediate conversion difficulty • Includes DVD with full TRANSFORMERS PRIME episode, "Loose Cannons"!